This is the same driver for HP 39g+, HP 39gs, HP 48gII, HP49g, HP49g+ and HP 50g Calculators. Here is the quick procedure of how you can obtain and install the USB drivers. This procedure is applicable for HP 40gs, HP 48gII and HP 50g Calculators. Note: This procedure is also similar if you have the Vista Operating System. After you have downloaded the software and double click on the zip file and you should see the screen like the above. Follow step 1 to 3 and one step 3, type in C:\ and click the next button. This will extract the files inside zip file and put them in c:\UsbDriver folder on your computer hard disk. Plug in the cable between the calculator and the computer. You should be able to hear a USB detection and if the driver has not be previously installed, the "Found New Hardware Wizard" will appear. 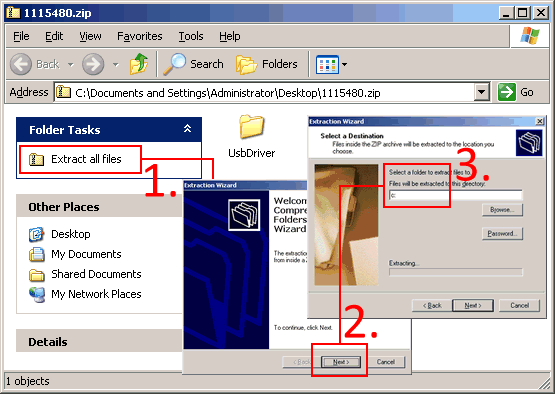 On step 5., remember to change the location of the file to C:\UsbDriver so that the installation wizard knows where to look for it. 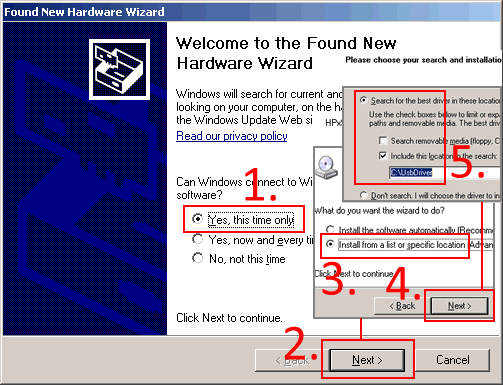 If you are prompted "Hardware Installation... HPx9g+ DEVICE...", do click on the "Continue Anyway" button. Right click on My Computer icon on the desktop. 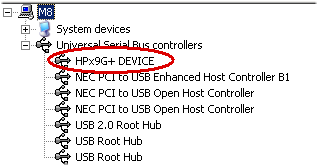 Click on Device Manager, and scroll down to "Universal Serial Bus controller". Click on the [+] icon to expand this key. Below is the newer USB Driver for HP49G+. If your driver version is smaller than 1.2.0.0 then you may want to download and update it. Look for HPx9G+ Device (if you can see this, re-connect up your calculator and turn it on). Select properties and verify the version. Download (File Size: 18KB) and unzip contents into as a folder. 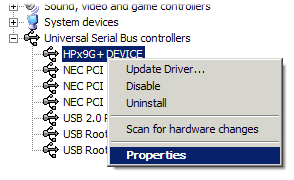 Right click on the HPx9G+ Device node and select the "Update Driver..." option. Tagged By: HP Connectivity Kit for HP 39g+ , HP Calculator Connectivity Kit (CONNX3) for HP39gs or HP40gs, HP50g Calculator Connectivity Kit (CONNX4) also for HP48, HP49.